i needed a quick game to play, so i dusted off my copy of the original gamecube animal crossing (for the first time in 31 months apparently, as my villagers were all quick to point out) in order to give the NES version of donkey kong jr. a spin. as i mentioned in my post about playing through the NES version of donkey kong, growing up i had owned the two games in the form of donkey kong classics, an NES cartridge that contained both of them, so i was looking forward to revisiting my childhood. (the game has also gotten more attention recently for being one of the club nintendo rewards and for being one of the 3DS ambassador rewards). anyway, as with my experience replaying donkey kong it didn’t take me much time at all to remember exactly how to get through each of the game’s four stages. i was reminded of the stiffness of the jumping controls of these early NES games, and i can see how people would be frustrated by it. the climbing mechanics are wholly enjoyable, though, and very responsive. they feel refined and are fun to master, and include a satisfying amount of variety, namely: a two-armed fast climb, a one-armed slow climb, a two-armed slow drop, and a one-armed fast drop. those mechanics have been revisited in subsequent games (such as the underwhelming donkey kong ’94 on game boy and mario vs. donkey kong on GBA), although more as minor diversions as opposed to being the main focus as in this game. the game is colorful, fun, and well designed, and has memorable enemies and locales. also, aspects of the game feel like they’re loosely connected to the original, such as the final stage of each game in which you have to repeat an action to free the captured target (in the first game you were tasked with jumping over rivets whereas in this game you’re pushing keys into locks). as with many of those early NES titles, the game provides 1 and 2-player alternating normal and hard modes, as well as virtually infinite looping of the game’s four stages. for retro game lovers the fun and challenge is in chasing a high score or seeing how many repetitions of the four stages you can get through, and although most people dismiss the game i personally find it a worthy sequel to the original. each stage has a distinct personality, and the climbing mechanics give the game a completely unique spin that still feels fresh. 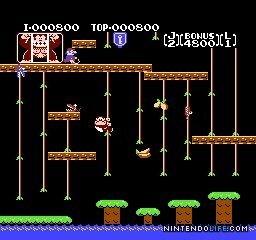 the one element that sticks out a little and doesn’t quite feel like it belongs is the spring in stage 2, but i find the game enjoyable and it would be awesome if a true revisit were ever created (or if donkey kong, jr. came back as a true character). i don’t recall ever playing the third of the trilogy (creatively titled “donkey kong 3“), but i’ll have to track that one down before too long.